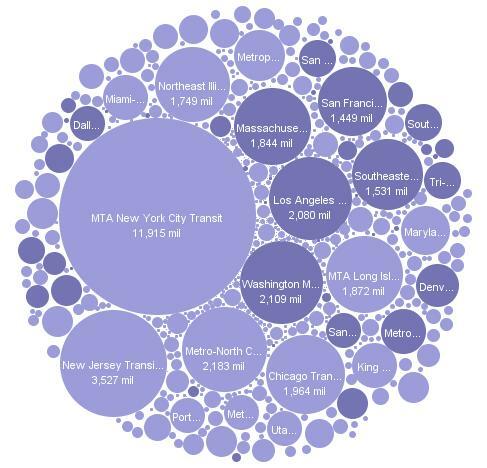 This image represents transit agency openess by size. Dark purple represents geographic areas with publicly aviailable transit data. Open data (also referred to as public data) is data that’s made available to software programmers. Open transit data on this site is defined as transit schedule data made publicly available in the GTFS format by transit agencies. Lack of open data is the biggest barrier to software innovation. One of City-Go-Round’s goals is to make all public transit data public. To do this, we show the benefit of providing open data (innovative apps built on top of that data) and also provide a list of agencies who haven’t yet opened their data. This project, supported by the Rockefeller Foundation, hopefully will draw attention to the problem of proprietary transit data that protects public agencies’ vendor relationships at the expense of the larger public interest. These relationship stifle cooperation , competition, and software innovation that increase the efficacy of transit.